The instrument compass is 63/30 with divided sliders. The console is attached to the organ case. The manual division, with the exception of the Oktave 4’, is under expression. The organ case is made from quarter-sawn American cherry wood, matching the woodwork of the chapel. 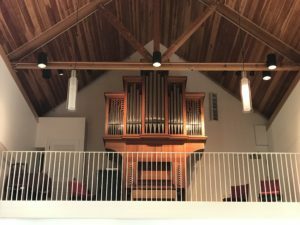 This instrument is located on the balcony of the new chapel. The donors’ wish was to name the chapel The Tree of Life Chapel. The pattern of the grillwork above the façade pipes is shaped like a leaf. The north side of the chapel has four large stained-glass windows representing the four seasons of the year. William Bowersox of Powers & Bowersox Associates is the Architect of the chapel. Franklyn E. Perkins, Interim Music Director (03/30/1929 – 08/06/2009) and Organ Consultant. Mr. and Mrs. Blanton Whitmire were donors of the chapel and organ. To increase the flexibility of this one-manual and pedal organ, Martin Ott added from g32 a Pommer 16’ and a Sesquialter 5 1/3’ + 3 1/5’. All manual stops have split keyboard (divided slider) between keys f#31 and g32. When the organist transposes the right hand one octave higher, the Pommer 16’ plays at 8’ pitch. In essence the 16’ becomes the 8’; the 8’ becomes the 4’; the 4’ becomes the 2’, and the Sesquialter becomes the 2 2/3’ + 1 3/5’. By increasing the key compass to d3 (note 63) and splitting the keyboard at f# – g (notes 31 & 32), the unpleasant overlapping of notes at the middle c (note 25) is eliminated, and one has enough keys at the top end (d3) of the keyboard for most written music.